iAtros Software, Inc. is proud to announce eRoentgen app for the iPhone. Physicians and other healthcare professionals use eRoentgen to choose the most appropriate imaging study for a selected diagnosis or symptom. eRoentgen quickly and easily improves patient safety and the quality of the imaging workup. Quality. By choosing the best test the first time around, the diagnosis is made quickly and accurately. Safety. Imaging tests are not without risk. Unnecessary exams increase radiation exposure and expose patients to contrast materials without clear benefit. Economy. Diagnostic imaging tests are very expensive. Inappropriate radiology testing represents a significant healthcare cost. Fewer 3rd party payor denials will reduce waste and diminish your administrative headaches. Convenience. Using the elegant and simple iPhone user interface of eRoentgen, the health care professional can easily and quickly determine the best imaging test while in the exam room. Keeping Current. Radiology is a vast and constantly-changing field. Keeping up with these changes is a daunting task. eRoentgen is an up-to-date, invaluable tool. Best medical practice management software. Find and compare Medical Practice Management software. Spy software for mobile phone. A list of the best mobile phone spy apps. 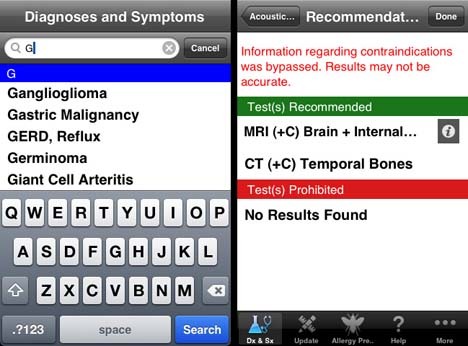 Top Medical Apps for Doctors. lists of physicians’ most-used medical apps on smartphones and tablets, according to the report. eRoentgen is distributed through Apple's App Store. 2. From your iPhone, run the App Store application. 3. Search for "eRoentgen" to locate it in the App Store. Follow directions to purchase and install on your iPhone. 1. Click here to go to the eRoentgen page on iTunes, to get more information and purchase. 2. Click on the Buy App button. 3. Sync your iPhone to your computer.